Snail's Trail pattern blocks are beautiful and complex-looking patterns that are really just squares and rectangles. The intricate pattern is merely the placing of the pieces in the correct order. Stitching the Snail's Trail quilt pattern on point gives a totally different appearance to the pattern, making it a versatile design that can be created in many forms. 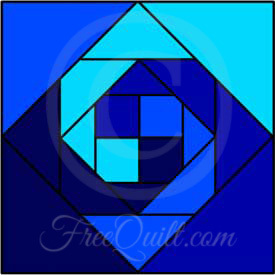 If you can follow directions, you can create this beautiful and stunning quilt for yourself or as a wonderful gift. This pattern is easy to sew and the results are dramatic. Snail's Trail quilts are great in either traditional fabrics or contemporary designs.